Greyhounds in the Mist: Darby Crash is going to be in a book!!!!!! Darby Crash is going to be in a book!!!!!! Project Dog! (if you flip through the sample spreads, Darby is the second page! A couple of months ago Kira Stackhouse of Nuena Photography contacted me about having one of my greyhounds be the AKC purebred representative in her new hardcover book Project Dog! 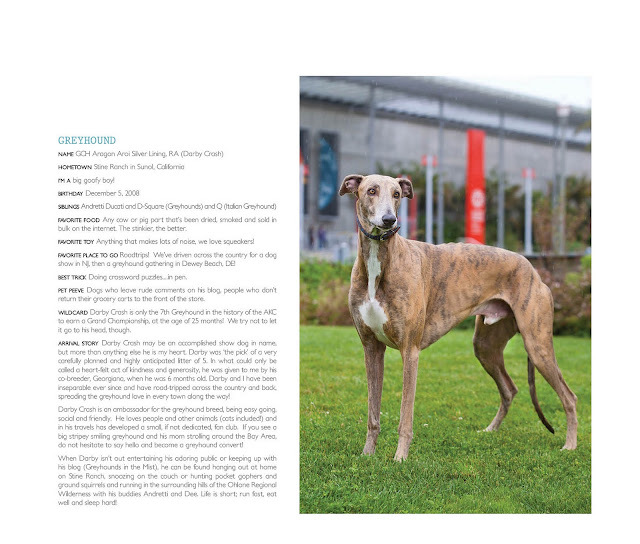 Project Dog is a 'coffee table style' book that features over 170 purebred dogs, one page for the AKC registered representative, and the opposite page for the purebred rescue/adopted representative of the breed. The entire book is over 300 pages of beautiful photography and a complete question/answer biography for each chosen dog! We were SO HONORED that she chose us!! Kira is a very talented and creative photographer based in San Francisco, this is the largest project she's taken on to date, and it is completely a labor of love. Love for dogs!!! We met Kira in San Francisco at the California Museum of Sciences in Golden Gate Park, the setting she chose for Darby's photo shoot. It was raining, of course. San Francisco in October = rain. Pleh. But it didn't stop Darby's enthusiasm. Post- professional photo shoot, in the rain, on the way back to the car where it was warm! When all was said and done, Darby and I sat down and filled out the questionnaire for the biography and then sat back and waited. After a few days Kira sent us the proof for his page. All total, it took Kira over a year of hard work (she quit her full time marketing job to take on this project), but the book is finally done! It went to print about 4 weeks ago, and the first 100 copies have been delivered for Project Dogs official launch party tomorrow at Wags Hotel (a posh doggy daycare and overnight dog-care hotel) in San Francisco. Darby Crash is one of the 50 dogs who have been chosen for the runway show at the peak of the party!! I'm using a lot of exclamation points because we are so excited to be a part of this project. Saturday (today) is the Launch Party in the city! Q and Art the Husband are tagging along for wine, cheese and doggie appetizers. We'll get to pick up our copies of the book while we're there. I'm so tickled.....my dog is in a real book! For any dog lover (greyhound or otherwise) this is a fantastic book. The photography is creative and professional, but what's even better are the biographies and personal stories of each and every dog in the book. You start out looking at the pictures of all the different breeds, but then you get drawn into each dog's unique story. Before you know it you've spent an hour reading and haven't really gotten past the breeds starting with the letter C! If you're interested in getting one for yourself or someone you know who loves dogs, go to The Project Dog Book Page and order one. You will not be disappointed, and somewhere in there, Darby Crash will be staring back at you from his very own page! How very cool and exciting! Darby makes a stunning model! Congratulations!